TGA is hosting 12 weeks of high energy, action packed, super fun summer camp! Check out our camp descriptions below and follow us on Facebook for weekly camp updates! We have a summer camp for everyone! A. 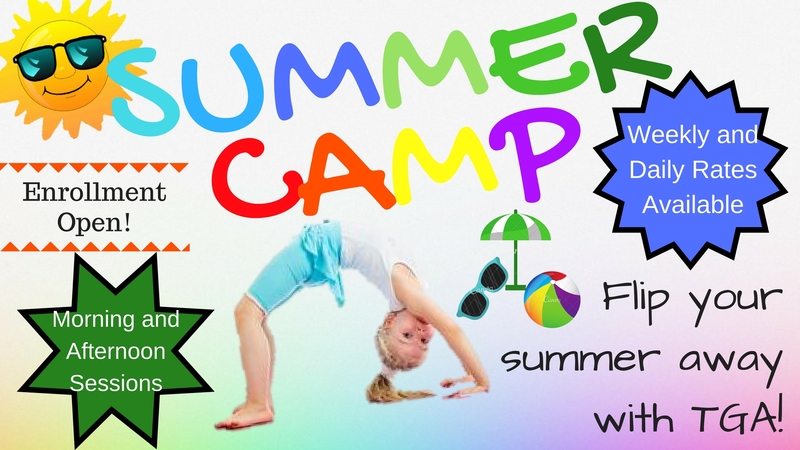 Pre-School Gymnastics Camp: This camp is for *4-5 year old boys and girls who want to move, groove, rock, and roll. Activities include Arts & Crafts and Tons of Gymnastics Fun-Trampolines, Moon-Bounce, and Obstacle Courses created for some of our smallest friends! Hip, Hip Hooray... Fitness and FUN! B. 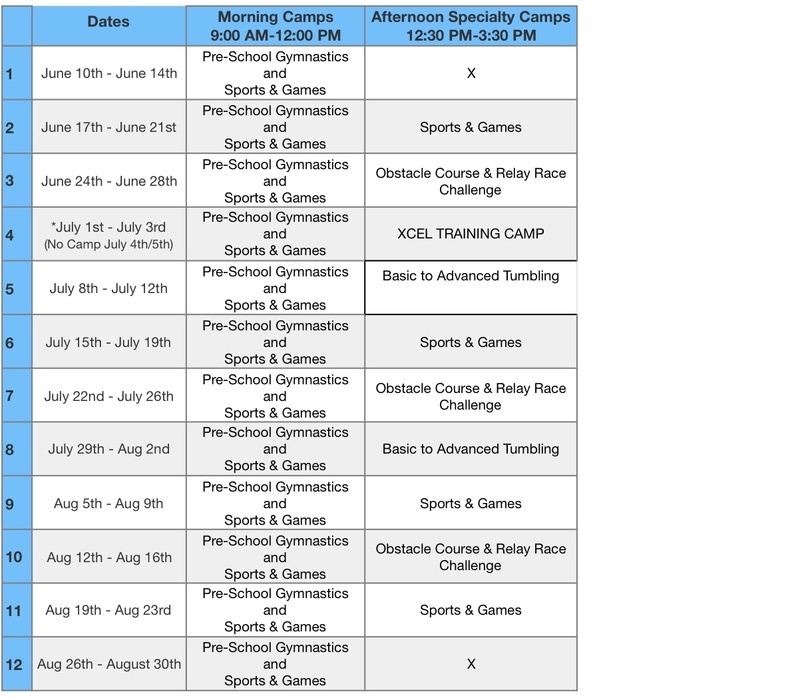 Gymnastics, Sports, and Games Camp: This camp is for active 6-14 year old boys and girls who want to run, jump, climb, bounce, roll, flip, and play games. Camp will consist of a variety of sports including GYMNASTICS, Basketball, Table Tennis, Dodgeball, and our NEW Obstacle Course Challenge. With this high-energy, action-packed camp, FUN is sure to be had! A. Basic to Advanced Tumbling Camp: This camp is for 6-16 year old boys and girls interested in focusing on tumbling, trampoline, tumble track, and conditioning. All levels WELCOME! While beginners will work rolls, cartwheels, handstands, and round-offs, more advanced athletes will work front/back handsprings, aerials, and saltos (flips). This camp is a great opportunity for both gymnasts and cheerleaders to focus on their tumbling skills! B. XCEL TRAINING CAMP: This camp will be a little more intense and will focus on more advanced skills and drills for these athletes. Girls in our XCEL TEAM PROGRAM are invited and encouraged to take part in this camp. C. Boys & Girls Obstacle Course/Relay Race Challenge: We are super excited to offer TGA's Obstacle Course Challenge Camp. While flipping, swinging, running, jumping, rocking, and rolling, boys and girls 6 to 16 years old will enhance all aspects of fitness through several different obstacle course and relay race challenges... Think "Ninja Warrior"
D. Gymnastics, Sports, and Games Camp: This camp is for active 6-14 year old boys and girls who want to run, jump, climb, bounce, roll, flip, and play games. Camp will consist of a variety of sports including GYMNASTICS, Basketball, Table Tennis, Dodgeball, and our NEW Obstacle Course Challenge. With this high-energy, action-packed camp, FUN is sure to be had! FLIP with us for the entire week or just a day or two! Weekly & Daily Rates Available. *If enrolled in morning session for the week, the price of the afternoon camp is $80 for the week. TGA reserves the right to cancel camps due to low enrollment. If TGA cancels a camp, full camp tuition will be refunded.